Ask the Readers is taking a break for the rest of the year. Today, I have something else for you. I greatly enjoy being a part of the personal finance community. Interacting with others that share similar dreams is loads of fun. You are all awesome. If your child is born on the birthday of a blogger friend, you must name your child after him or her**. As fate would have it, Babywoods was born very close, but not on my birthday. I was deeply disappointed. As a consolation prize, the Frugalwoods were kind enough to let me write a guest post! I guarantee that is has nothing to do with baby names or 3rd rate James Bond villains, so click your mouse over to Frugalwoods and check it out! Also, don’t forget to wish The Frugalwoods well with their new addition. Congratulations! You are going to be awesome parents. *The first rule of Blog Club is: You do not talk about Blog Club! **Yeah, I totally just made that up. We have no rules***. ***Except for the one that states you must show up with gifts of beer. I would have went with Fifteenhundretta. This is my favorite rule of the “blog club”. Mil Quinientos would have been a pretty first/middle name combination. 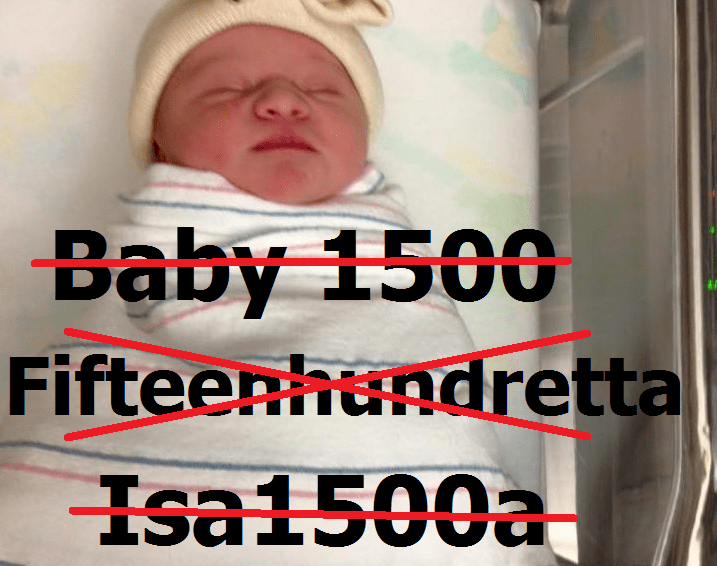 1500-a is what I was thinking. Read it like this: 1500-dash-a tehe! My favorite was Fiftina, sounds like Cristina.